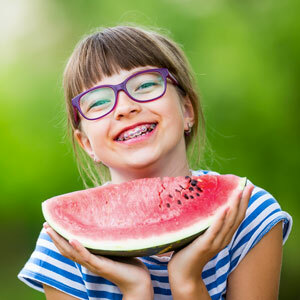 If you or your child would like to have a beautiful smile that’s properly aligned, you can achieve the results you want with trusted traditional metal braces. They’re not just a budget-friendly orthodontic option; they can provide fantastic outcomes in short treatment times. At Anthony Spink Dental Suite, we can provide tried and tested braces that will get you optimum results. When compared to other forms of orthodontic treatment, traditional braces are generally the most cost-effective option. Additionally, they can correct a wide range of orthodontic concerns, though certain issues may take longer to treat than others. It is ideal for families who have children that need to have orthodontic correction or anyone else who is seeking a way to address their teeth without breaking the bank. Over time, you’ll notice that your teeth are being gently guided into their new position using the wiring and metal brackets. Each step of the process will be discussed with you in full so that you can begin treatment feeling informed. During your consultation, you’ll have a thorough assessment done of your jaw alignment and teeth placement. Afterwards, we can create a treatment plan and give you an estimation of your total treatment time. Food can be easily caught in the metal brackets of your braces. You must be sure to care for them meticulously so that particles don’t become lodged in them. Brushing and flossing should be done at least twice daily. A gentle hand is necessary so that the brackets aren’t compromised. Brushing should be done after each meal to prevent food from discolouring your teeth. We offer payment plans through zipMoney and participate with smile.com.au. Contact us today to schedule an evaluation for traditional braces Brighton!